There are many benefits of being self-employed that make up for the risk and uncertainty of working for yourself. Do you agree with these? Getting out of bed late and being able to work in their pyjamas. This is the image conjured up by many employees when they think of freelancers and self-employed workers. While this is generally far from the truth, there are many perks of being self-employed that you’re unlikely to experience as an employee. Some of these are reasons why most self-employed workers wouldn’t go back to working for a company. You can choose when and how you work. You may work best in total silence or with music blaring in the background. Or perhaps you’re a night owl and work best in the evening and early hours of the night. Even with flexible working now a possibility for employed workers, it’s doubtful that most employers would approve this kind of work schedule. When you’re self-employed, while your client will have final say on what you produce, you can decide what hours you work and how you do it. This gives you much more flexibility and freedom than in a traditional employee role. You can fit your life around your work, not the other way round, allowing you to take a long lunch if you want, to finish early so you can see your daughter’s school performance or simply to work at home while waiting for a delivery. You can decide where you work. Depending on what you do, you may be able to avoid a lengthy commute and work from home, have your own workshop or choose to work from different venues, such as coffee shops or shared offices. This can give you variety in the type of people you’re working around and if you’re not commuting, it can also effectively give you more time in the day and reduce your travel expenses. You reap the benefits of all the hard work you put in. If you’re self-employed, no one takes the credit for your successes but you. And as you benefit directly from the work that you do, you’re likely to work harder for yourself than for an employer. Achieving your targets and developing a good reputation can give you a great sense of pride and satisfaction. You can choose who you work for. If you’ve just started working for yourself, you may feel the need to take any and all work that comes your way, leading to you working long hours and on some less-than-ideal projects. However, once you’re more established and have the experience behind you, you’re more likely to be able to choose who you work for. This means you can avoid particularly difficult clients or those who quibble over payment after you’ve done the work, for example. Conversely you can also develop strong relationships with the clients who you want to work for. You can choose who you work with – if you want to work with anyone at all. You may not have employees, but you may work closely with suppliers or outsource some work and you will have complete control who you work with. And if your business grows and you need to take on staff, you get to decide who that should be, not anyone else. You develop a wide range of skills. Whether you’re an IT contractor, freelance writer or a tradesman, when you’re self-employed you’re more likely to work on a range of different projects. This means you’ll constantly be developing your professional skills, as well as the skills it takes to run a business, such as marketing and looking after your accounts. It’s available to everyone. You don’t have to be exclusively self-employed. You can be employed, giving you a reliable income and supplement this by working for yourself in the evenings or part time. Or, if you’re retiring but don’t want to stop working completely, becoming self-employed can help you to keep your mind active and provide a welcome top-up to your pension. Equally, it can be ideal if you’re a parent, giving you the ability to balance your work and family commitments. 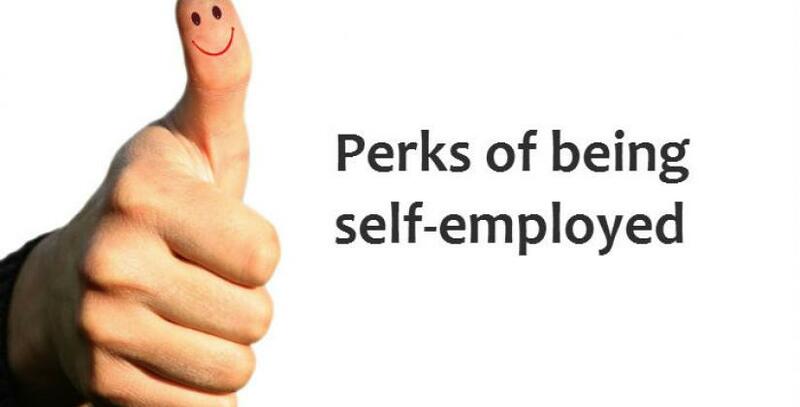 ​Tweet us your top self-employment perks.